Located adjacent to JFK International Airport in Queens, N.Y., Bergen Basin has been recently listed as one of the most polluted waterways in the New York metropolitan area by Government Executive. One of the culprits is a bottleneck in a sewer conveying flows from South Ozone Park to the Jamaica Wastewater Treatment Plant. When the sewer is overwhelmed, untreated sewage flows directly into Bergen Basin leading into the Jamaica Bay. In a project designed to reduce overflows, the New York City Department of Environmental Protection (NYCDEP) undertook the Bergen Basin Sewer Reconstruction project, which involved the construction of a new interceptor sewer under the Belt Parkway. 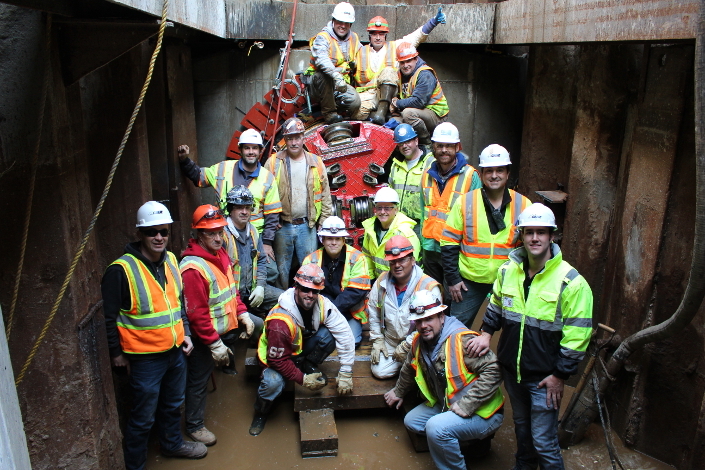 JRCRUZ overcame a variety of challenges to successfully complete the Bergen Basin Sewer Reconstruction project. The project, however, involved its share of challenges, including working in proximity to existing infrastructure while minimizing disruption for residents, businesses and commuters, particularly along the heavily traveled Belt Parkway. The groundwater table and flowing ground conditions added to the complexity of the job. In the end, new technological approaches, innovative engineering solutions and good old-fashioned teamwork led to the successful completion of the project. In its efforts to alleviate CSOs in its territory, NYCDEP planned the Bergen Basin project with lead consultant Hazen & Sawyer and underground facilities designer and geotechnical consultant Mott MacDonald. 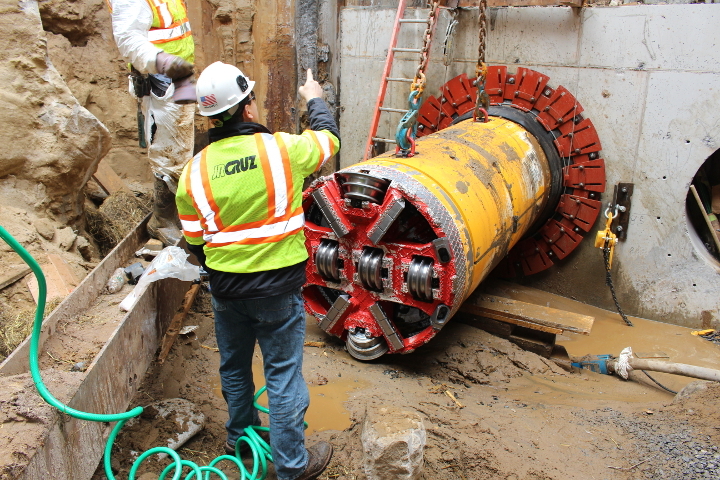 In 2015, construction began on the $20 million Bergen Basin Sewer Reconstruction project, which was awarded to JRCRUZ Corp. The project involved building a new interceptor that would serve to increase conveyance capacity, alleviate the bottleneck and therefore reduce sewer overflows. The project had its share of challenges from the start. The project work area was located adjacent to the Belt Parkway, a heavily trafficked thoroughfare serving Brooklyn and Queens, with the new interceptor crossing underneath the roadway. In this urban environment, minimizing disruption was paramount, leading to the decision to use trenchless methods. The ground conditions included artificial fill and glacial outwash below the groundwater table. Planners expected a relatively uniform condition of cohesionless soils with flowing conditions. The ground conditions in combination with the size of the pipe to be installed led to microtunneling being selected as the trenchless construction method. Scope of work: 1 66.5-in. tunnel drive (~300 lf); 2 45-in. tunnel drives (~320 lf); 3 shafts (1 launch shaft, 2 reception shafts) at ~30 ft deep. The primary scope of work comprised two microtunneling drives and the construction of three access pits – one drive pit and two receiving pits. One drive paralleled the Belt Parkway, while the other crossed underneath. However, the Belt Parkway crossing had one additional complication – an existing 42-in. storm sewer crossed the planned microtunnel alignment. As a result of the conflict, designers developed a plan that would reroute the storm sewer, which would have required major disruption to the Belt Parkway. The portion of the storm sewer interfering with the new interceptor alignment would then be demolished to allow the tunnel to the pass, and then reconstructed and reconnected. When JRCRUZ Corp. was brought on board as the microtunneling contractor, it offered a Value Engineering Proposal (VEP) to deal with the conflicting 42-in. storm sewer. In looking closely at the alignment, JRCRUZ determined that by downsizing the 48-in. pipe crossing the Belt Parkway to 36 in., it could pass beneath the existing 42-in. storm sewer – with about 10 inches to spare. To provide sufficient conveyance capacity, JRCRUZ proposed using twin 36-in. crossings instead of a single 48-in. crossing. The concept of using smaller pipelines had been discussed in the preliminary planning stage, but had not been pursued due to unknowns concerning the existing storm sewer – its exact elevation, whether it had been built with a cradle, and whether there were piles. The risks due to these unknowns resulted in the option being eliminated during the planning stage. Once the project was in construction, JRCRUZ was in a position to undertake more invasive investigations and confirm the viability of using twin 36-in. crossings. JRCRUZ was granted access to the storm sewer and was able to perform test drills to confirm that the storm sewer was not built with a cradle that would impede the progress of the MTBM. Survey work was performed, including at the intersection points with the proposed microtunnel drives to confirm the elevations. Additionally, a crew drilled probe holes via horizontal directional drilling (HDD) along the proposed alignment of the additional crossing to check for the existence of obstacles. Two probes were drilled for each crossing – at the 2 o’clock and 8 o’clock positions of the tunnel cross section. These supplemented HDD bores performed during the design for the original crossing. The successful completion of the probe holes and supplemental survey information gave NYCDEP and its consultants confidence to move forward with the VEP. Given the combination of low clearance, soft ground, short pipe lengths (4 ft), and the lack of a cradle, the decision was made to maintain a zone of grouted ground around the existing storm sewer to protect it in the event of settlement. The project involved twin microtunnels underneath the Belt Parkway, a heavily trafficked thoroughfare serving Brooklyn and Queens. Moretrench was brought on as the ground improvement contractor and used permeation grouting to form a block of treated ground around the storm sewer. Hydratite joint seals were installed inside of the sewer at the joints to prevent grout infiltration into the sewer. As an early warning to potential damage due to ground movement, a settlement monitoring program was set up along the microtunnel alignments. By using the contractor’s VEP, the owner was able to realize significant savings compared to the project’s originally estimated cost. In dealing with the flowing ground conditions, JRCRUZ brought a new approach to the table by using innovative launch and reception shaft seals. These seals included a high-head, double-lip seal as opposed to a more traditional single-lip approach that can be susceptible to damage. The contractor’s approach also included using a cartridge-type system preinstalled into the double-lip seal within the shaft wall for the reception shafts. A more detailed description of this seal will be forthcoming in a future technical presentation. As a result of the project, the owner was able to save money from its original estimate and the Bergen Basin and Jamaica Bay will ultimately see benefits through improved water quality, all the while reducing impacts on residents and businesses during the construction process. Jim Rush is editor of Trenchless Technology.